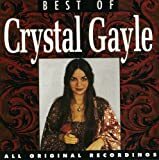 Brenda Gail Gatzimos (née Webb; January 9, 1951), known professionally as Crystal Gayle, is an American singer. Best known for her 1977 country-pop crossover song, "Don't It Make My Brown Eyes Blue", she had twenty #1 country songs during the 1970s and 1980s (18 on Billboard and 2 on Cashbox) with six albums certified gold by the Recording Industry Association of America. Gayle became the first female artist in country music history to reach platinum sales, with her 1977 album We Must Believe in Magic. Also noted for her nearly floor-length hair, she was voted one of the 50 most beautiful people in the world by People magazine in 1983. She is the younger sister of the country singer-songwriter Loretta Lynn and the singer Peggy Sue and a distant cousin of singer Patty Loveless. Gayle is a member of the Grand Ole Opry and has a star on the Hollywood Walk of Fame, near Lynn's star.